I have a longstanding interest in the relationship between land reform, sustainable communities and public policy in Scotland. That relationship provides a focus for much of the commentary and analysis I produce via my blog Beyond the Horizon, media articles and academic output. My 2009 Scotsman article (Cash Up-Front or Right to Buy is Meaningless) called on the Scottish Government to reintroduce the then defunct Scottish Land Fund to support community buyouts. In 2010 I led a study on Post-Legislative Scrutiny of the Land Reform (Scotland) Act 2003 on behalf of the Scottish Parliament. The research examined implementation of the access, community right to buy and crofting community right to buy provisions of the Act. Along with colleagues, I gave evidence based on the study's findings at the Rural Affairs and Environment Committee's meeting on February 9th 2011 and its successor Committee's meeting on September 21st 2011. In correspondence with the Scottish Government's Environment Minister, the Rural Affairs and Environment Committee commended the study's report as "very clear and thorough" and agreed with its main conclusions. My West Highland Free Press article of March 11th 2011, Assessing the Land Reform Process, discussed the Act's Community and Crofting Community Right to Buy provisions and stated that there was a pressing need to reignite the political momentum which drove the community land movement in the pre-Land Reform Act era. Partly in response to the Parliament's scrutiny of the Land Reform Act, the Scottish Government announced the formation of the Land Reform Review Group (LRRG) in 2012 to develop "innovative and radical" proposals to take the land reform agenda forward. The research which I led on behalf of the Scottish Parliament is extensively cited in an Overview of Evidence on Land Reform in Scotland published by the Scottish Government to accompany that announcement. My West Highland Free Press analysis of the LRRG's final report (The Land of Scotland and the Common Good ) can be accessed here and my analysis of some of the Scottish Government's subsequent land reform proposals can be accessed here. 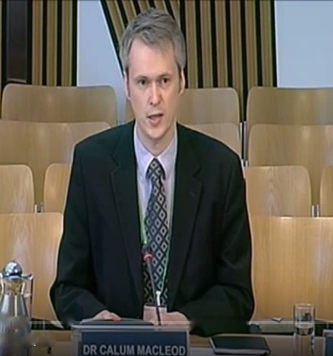 I appeared before the Scottish Parliament's Rural Affairs, Climate Change and Environment Committee to give evidence on the LRRG's report in June 2014. I also appeared before the UK Parliament's Scottish Affairs Committee to give evidence on the report in July 2014. I've also written on Land Reform after the Referendum for Bella Caledonia. Following my Focus article of March 6th 2015 for the West Highland Free Press on Why the Croft House Grant Scheme Matters , Brian Wilson used his WHFP column of March 13th to call for cross-party support amongst Crofting Counties MSP's for the restoration of the scheme's value and the reintroduction of a loan element to it. The Scottish Government subsequently restored the loan element to the scheme following a public consultation exercise. I was commissioned by Highlands and Islands Enterprise to write a discussion paper on The Future of Community Land Ownership in Scotland for the national Strengthening Communities conference held in Aviemore on Sept 21st and 22nd 2017. An abridged version of the paper was subsequently published in the West Highland Free Press and can be accessed here.